A description of what an electric heated blanket depends on which part of the world you are standing in the cold in. In the US and in Canada, an electric blanket is a simple heating device placed over the top bed sheet. While in the United Kingdom, an electric blanket is something like a heated mattress pad placed below the bottom bed sheet. However which way they are positioned in your bed, electric heated blankets are used to pre-heat the bed or to keep the bed occupants warm on cold, chilly nights. Normally, electric blankets would have a control unit that can adjust the temperature the blanket produces. Other bigger blankets meant for 2 or more people in a bigger bed may have separate control units for either side of the bed. It is unclear when the electric heated blanket was introduced to the market. But the first electric blanket was invented by an American, Samuel Irwin Russell, back in 1912. Russell’s initial design was something like an “underblanket” which was placed under the bed and heated the bed from below it. There is a dispute on the year when the first “overblankets” were made. Some record it as 1930 when Samson United Corporation first sold electric heated blankets that were placed over the sleeping person on a bed. We have already written a complete guide about best Bed Throws And Blankets. How do electric heated blankets work? What is the difference between an electric heated blanket and a heated throw? Similar to a heating pad, electric blankets use insulated wirings or heating elements inserted in a serpentine structure into the fabric. When plugged, electric current passes through these wires that generate heat. A thermostat or temperature control unit is located between the plug and the blanket. This controls the amount of electricity that runs through the wires so that temperature can be moderated by the user. The more modern electric blankets now use carbon fiber wires. These carbon fiber wires are certainly less bulky and close to weightless, accounting for a more comfortable use of the electric blanket. This is the same technology that one can find in luxury vehicles’ heated car seats. As people are always on the lookout for products that can supply targeted heat without having to maintain or keep a furnace or a fireplace burning, or a space heater running for hours and consuming costly electricity, electric heated blankets provide warm and cozy comfort while allowing the user decreased energy consumption bills. With winter come the cold, and the constant need to keep warm. People look for products that can help them be cozy warm. 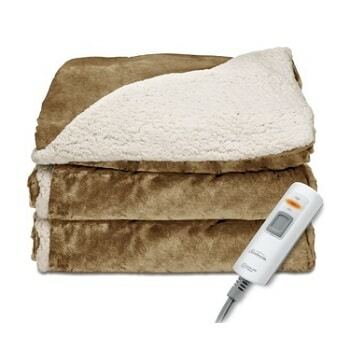 Two such products are an electric heated blanket and an electric heated throw. These two can be differentiated with their purpose or use, and size. A heated throw is normally used by a lone person while watching TV, enjoying a good book or taking a short power nap. Throws can be found in the living room, a home office or in one’s vehicle. They are average in size and are placed on one’s lap or around the shoulders. When they are not used, they can be considered decorative when thrown over the back of a couch or the armrest of an armchair. An electric heated blanket is mostly used as bedding and obviously found in the bedroom. It is used in conjunction with a comforter or a duvet depending on the winter temperature of your home. Heated blankets are a good alternative to a space heater or a fireplace. Using such can help save the user loads of energy consumption bills. Heated throws do not really follow a sizing guideline. So when purchasing one, you really need to check its size dimensions. Normally, a throw would be in the 60” x 45” size range but those meant to be brought for travel can come in smaller sizes. An electric blanket on the other hand follows standard mattress sizes. 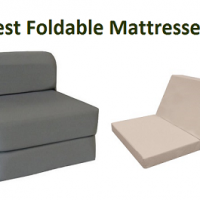 They can come in twin, full, Queen and King sizes to match whatever mattress size. Some would think an electric heated blanket is a plug-and-play kind of device. To some extent, it is. However, you need to be mindful of the Instruction Manual and take time to read it when setting up the product. Do not use on infants, very small children, persons with disabilities or anyone who cannot operate the controls. Avoid using the electric blanket in an adjustable bed, a sofa bed, reclining chairs or the like that can pinch the wires. When storing, do not loop the cord around the control panel as this may cause damage. Do not let your pets play around the heated electric blanket as their claw or teeth may damage and puncture the wires. Turn off the device when not in use. Never use an electric heated blanket on a water bed. Never iron your electric heated blanket as this may melt the wirings and insulation. Do not use pins on your heated blanket to avoid puncturing the wires. A good heated blanket when given proper care should last for a good 5 years. The fabric and the wirings should feel comfortable and flexible to you. The control panel should function properly and the fabric should withstand repeated washing and drying. When buying a heated blanket, you must consider how it is handled and used. Particularly, people with poor eyesight should look for one with controls that have large and bright dial settings; or people with poor grasping abilities should get one with large knobs and handles. For blankets that two people will use, consider if there are separate heating controls. Will the size of the heated blanket be enough for thicker mattress heights? Consider as well if the weight of the blanket is OK.
Retail prices of heated blankets depend on the fabric used, the size and quality. Prices may range variably up to $120 for a basic model and up to $200 or so for a deluxe model. This may seem a costly sum as an initial investment but you must consider the long-term savings from reduced energy costs as you will most definitely lessen use of a furnace thermostat at night. Last, but definitely one of the most important factors to consider in purchasing an electric heated blanket is safety. Never purchase a heated blanket without the UL or ETL marks on it. These are certification marks in the US which show that the product passed safety standards. It is best that you read product reviews meticulously and compare with other products to ensure you get the product most suited for your needs. 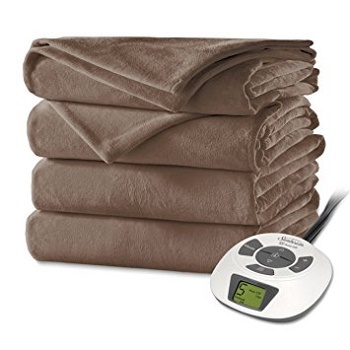 The Queen size Sunbeam Premium Soft Velvet Plush Heated Blanket in beige color is true to its name of providing velvety soft warmth and comfort. It comes with 20 personalized heat settings that you can adjust to your temperature requirement. With its thermofine warming system, you can sleep the night away in comfort as it auto-adjusts to keep the level of warmth consistent as you slumber in cozy warmth. Get more comfy by also getting one of the Dynasty Mattresses. This blanket uses only the best velvet plush material. It is soft and light to the touch which gives a luxurious feeling of warmth and comfort, perfect for cold wintry nights. It is hemmed perfectly, giving it an aesthetically beautiful finish while ensuring good quality that will last a long time. There is absolutely no need to bring this blanket to the cleaner’s! The Sunbeam Premium Soft Velvet Plush Heated Blanket is fully machine washable and fits your dryer perfectly. As it is made of light material, it is very easy to wash and dry. This heated blanket is very easy to operate. It has 20 different heating settings which you can adjust quite easily to suit your preferred level of warmth. And with its advanced technology, you can sleep the whole night in comfort without any worries because it will adjust automatically on its own to keep the temperature level constant to the setting you prefer. You can rest easy with using this heated blanket. It features an auto-shut off system so there is no need to feel paranoid on days you leave the house in a rush and are unsure if you unplugged it. It will automatically turn off after 10 hours of use, giving you that peace of mind that you and your home are safe. It also comes with a 5-year limited warranty, and is produced by Sunbeam, a brand trusted for over a hundred years. This heated throw comes in 50” x 60” size and is made of 100% polyester. This size is just perfect for an average-built person to snuggle in comfortably. The throw has a Thermofine Warming System which automatically adjusts the heat to make constant warmth as you use it. This heated throw is of perfect size for an average individual. It is made of 100% polyester, very durable and thick enough to keep you staying warm and toasty even when it is not plugged. Made of premium soft velvet plush, it gives a feeling of luxury, wrapping you in elegance and stylish comfort. The garnet red color of the throw is a rich and classy color that complements your personal style. For added comfort and snuggly warmth, this heated throw can be used under your regular blanket or placed under your sheets – to keep you feeling warm and comfortable as you sleep. Its power cord is long enough to allow you to plug it in anywhere, measuring 6 feet to the controller and another 2 feet from the controller to the power socket. Like most Sunbeam blankets, this heated throw fits your washing machine load quite easily. You can wash it with other similarly-colored laundry because despite its rich, dark color, it is fully colorfast. It is dryer-safe and you can launder it again and again without worry of wearing it out. The throw comes with a Thermofine Warming System and three different heat settings. The technology allows for automatic adjustment of the temperature of the throw to keep your desired warmth constant for the hours you will use it. And even if you forget to turn it off, it comes equipped with a safety feature of an auto-shut off giving you peace of mind. Designed to provide gentle warming heat, it will not feel warm to the touch, but will give you hours of snuggly warm comfort. 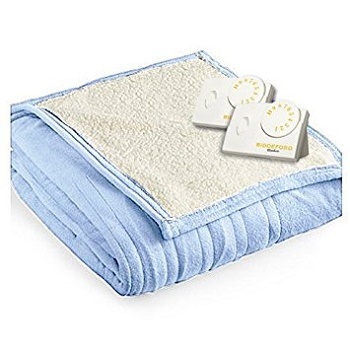 With luxuriously soft micro-plush fiber, this heated blanket converts a regular 120 AC home current into an ultra-safe low voltage DC current that is safe even when the blanket gets wet. Its controls allow for adjustments of temperature on both sides of the queen-sized blanket. The thin wires are practically unnoticeable and are spaced three inches apart providing constant warmth from head to toe. It has an automatic shut off feature that turns off the power after 10 hours of use, just in case you forget to turn it off. 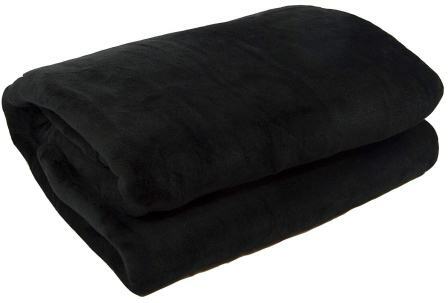 This 100% polyester blanket is made of ultra-soft micro-fleece fabric that will last a long time. It is soft and comfortable, perfect for snuggling in on those chilly nights. The thin wires are barely noticeable but are guaranteed to perform durably. The blanket is sized 16x16x13 inches and is perfect for a queen-sized bed. It is built for sharing and gives both persons his own control function on his zone, allowing him to regulate the warmth on the zone that covers him. It is manufactured with the heating wires intelligently placed and spaced conveniently apart from each other which warms the blanket constantly in its entirety. You will never have a cold spot in any part of the blanket. This blanket does not give off a high temperature and will not feel hot to the touch of your hands. But as you snuggle under it, it will give off constant warmth that provides comfort the whole night. Its technology of converting a regular 120 AC home current to a low voltage DC current makes it one of the safest blankets in the market. With the low-voltage current it uses, it is so safe that even if the blanket gets wet while in use, you can rest easy that nothing untoward will happen. So you can just go ahead and eat that popcorn or have that hot mug of chocolate as you watch TV while under this warm electric blanket! This heated blanket also has an auto-shut off function which automatically turns off the product after 10 hours of use, leaving you paranoia-free and safe. The Biddeford Comfort Knit Fleece Electric Heated blanket is the perfect snuggle up blanket for the coldest of winter nights. This soft polyester blanket can warm you up and give you a restful night of sleep and relaxation. Using this heated blanket helps you save on energy consumption bills because you can turn down your heated furnace at night and just rely on this heated blanket for warmth and comfort. The material is made of very soft and fine fleece that is soft and smooth to the touch. It does not have a scratchy feel to the skin and will leave you in satiny soft comfort when you sleep at night. With multiple heat settings, you can use this blanket year-round, as you can personally customize heat levels and adjust to your required temperature. It provides constant heat and turns off automatically after 10 hours, leaving you worry free for any mishaps and accidents. It comes in a perfect size to cover an average sized adult comfortably without toes and elbows peeping out. Each wiring system has a stitching around it that contains it and avoids entanglements, giving you confidence that it is safe and convenient to use. It is not too heavy, nor too thin, but is adequate and comfortable. Though lightweight and thin, this fleece electric-heated blanket is surprisingly warm and adequate for a chilly night. Its material is soft yet durable and can withstand many washings. The wirings are barely noticeable but they stay in place even after storage and many washings because each wiring is stitched in place. This can assure you of good quality and durable use for many years. Because of its thin material, it cleans and stores conveniently. It can be washed with other loads in a regular washing machine and can be loaded in any kind of dryer. When not in use, it folds neatly and does not take up to much storage space. It can be stored in a zipper bag, ready for use at an instant. The blanket has a mechanized warming system that adjusts the temperature setting on its own to keep the blanket at a constant temperature throughout the night. You won’t ever have to wake up feeling either too warm or too cold in the middle of the night. It also has a power off system that shuts down the electric heated blanket after 10 hours so you will feel safe and secure every time you use it. Made with 100% polyester, micro-plush top and Sherpa bottom, this heated blanket is perfect for getting warm on those cold wintry nights. It has 10 personalized heat settings that can provide that just-right temperature as you need. It also has a safety feature of an auto-shut off after 10 hours that gives you peace of mind. It is machine washable and dryer safe, and comes with a five-year manufacturer warranty. This heated blanket uses two kinds of materials – micro-plush on top and Sherpa at the bottom –giving you double the comfort! The material is built to endure many washings and continued use. With a 5-year warranty, you are assured of long years of snuggly comfort under the sheets. The blanket is sold with a re-usable zipped bag which conveniently allows you storage for when the days are warmer and the blanket needs to be stored. It has 10 different heat settings that are easy to control and adjust to give you your preferred temperature. It can be laundered safely with other items in your laundry bin, and is dryer safe. You can rest easy with the automated power off system of this blanket. On days when you need to rush out and may forget unplugging devices, this heated blanket will turn off on its own after 10 hours of use. 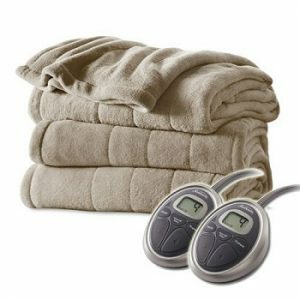 This Sunbeam Heated Electric Throw Blanket is the ultimate in softness with the finest micro-plush material. It uses Thermofine warming system technology that adjusts automatically to give constant heat for hours. The control box has three heat settings and has an auto-off system after three hours. For an alternative, here is also a list of the best bed throws and blankets. 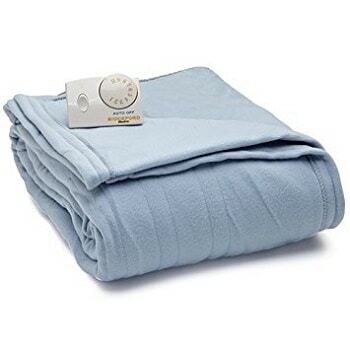 The deluxe softness of this heated throw is the ultimate in snuggle moments. It is made of the softest fleece that gives you that plush, luxurious feel. The material and the wirings are of prime quality, assuring you of long years of use. The controls of this heated throw is lit for easy use even at night. It has three heat settings which you can adjust according to your choice of warmth. And with its advanced Thermofine technology, it can automatically adjust the temperature to make it constant throughout hours of use. With extended length of the power cord, you are free to plug and snuggle anywhere. The 100% polyester fleece is fully machine washable and safe to use on any kind of dryer. Throws are meant to be used for short naps in the comforts of your living room couch or your favorite chair. With this in mind, this heated throw comes with a safety feature of an automatic shut-off system after three hours of use. So you can avoid being paranoid over safety concerns. Made with seven layers, this heated blanket provides the ultimate in comfort. Soft wire technology is enclosed in between a specially crafted wet-proof cloth, wrapped in a layer of very soft down, then alternating polyester on top and bottom, added with another soft layer of micro flannel, and finally quilted together and hemmed with a stylish satin. This blanket not only provides comfort but adds elegance and classic style to any bedroom. It has eight secure heat settings with a 10-hour auto-off mode. Seven layers of comfort. Yes, you read that right! This blanket uses seven different layers of quality material that provides supreme comfort. Durable and long lasting, you are assured of many, many years of dependable use. And with the seven alternating layers of down, polyester, micro flannel and quilting material, you get seven times the assurance of quality material. The electric heated blanket is equipped with eight secure settings that you can adjust to the level of warmth you prefer. That allows you to personalize its use, and make it your own snuggly comfort go-to blanket. And with it’s 16-foot long power cord, you can plug it anywhere and ensure that you don’t get tangled in wirings or pull it accidentally and unplug without meaning to. Despite its multiple, delicate layers, this heated blanket can be washed using any kind of washing machine. It is also dryer safe. So there is no need to bring it in for dry cleaning service. The wirings inside the heated blanket is covered in wet-proof material. This gives you added safety and security that you can use this blanket with peace of mind. It also comes with the technology of auto power off after 10 hours of use. ETL tested and comes with a 5-year warranty, this product speaks of safety like no other. Weighs 3.5 pounds and ships at 4 pounds, this 60”x50”x.2” throw manufactured by Sunbeam is reversible with super soft Royal Mink material on one side, and comfortable Sherpa on the other side. It comes with EliteStyle II Control with three heat settings and a three-hour auto-off function. Made with 250gsm Sherpa and 200gsm Royal Mink, the thread count of those fabric make for a really soft and luxuriously comfy heated throw. 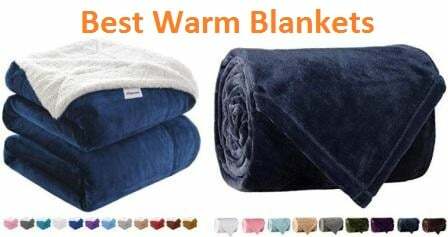 Reversible and can be used on either side, you can use this heated throw comfortably for 3 hours straight at constant heat. This heated throw has built-in features that will make you enjoy it for many years. It has a built-in auto heat sensor that keeps your warmth level constant. The control system comes with three heat settings and is fairly uncomplicated to use. Just plug, adjust to desired heat and use contentedly. 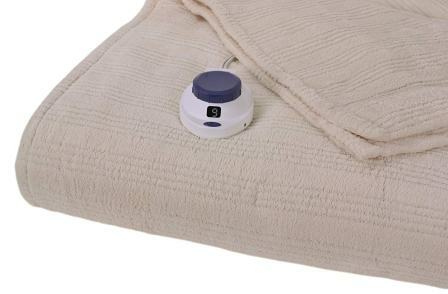 The EliteStyleIIControl technology of this heated throw makes you relax in secure comfort. You can safely adjust heat levels to three different settings and leave it on as it automatically shuts down after three hours of use. This heated blanket comes with state-of-the-art technology ComfortTec Controller that has a digital LED display, adjustable dimmer and push button controls. The king and queen sized blanket offers two controllers for the two zones of the blanket allowing you and your bedmate the freedom to choose from 10 different heat settings. This heated blanket also has a pre-heat function which warms up your cold sheets before you slide into them. It has the trademark Sunbeam Thermofine warming system which senses and adjusts accordingly to give you constant warmth the whole night. Made with the quality assurance of the brand long trusted by many, the Sunbeam Micro-plush heated blanket is a product built to last many years of use. With a thread count of 180gsm on each side, it is comfort and quality rolled into one. Made to be used by two people in a bed, the heated blanket comes with two zones of heated comfort. Each zone can be independently controlled. The blanket comes with two controllers where the user can choose from 10 different heat settings. What more, the controllers have digital LED display which illuminates at night to allow you convenient use in the dark. It also has a pre-heat function which allows you to set it on pre-heat mode before going to bed. It is an intelligent product with the trademark Sunbeam Thermofine warming system that constantly adjusts the temperature level the whole time it is in use. It is machine washable and dryer safe. It gives supreme peace of mind when it comes to safety features. After a restful night in bed, it will automatically power off after 10 hours of use. Comfort, convenience and colorful style make this heated blanket a good choice. Using velvet plush, it provides the cushiest comfort for you. It is manufactured by a trusted brand, Sunbeam, that gives you a five-year limited warranty. It is fully machine washable and dryer safe. With the exclusive wiring system, this blanket adjusts heat throughout the blanket. It has 10 varied heat settings and an optional auto-off mode. You should also get the most of your comfy sleep with one of the best Tempurpedic mattresses. The product comes with a five-year warranty, giving you confidence that it will last at least that many years in use. It is made with imported velvet plush of the highest quality fabric ensuring tatter free use even after several washings. The wirings are secure and won’t push out of the blanket material even when folded after several years. An electric device that goes safely into the wash and comes out of any type of dryer – you should give it a two-thumbs up sign of approval. It is so easy to use that you literally just plug and snuggle under. It will adjust heat constantly throughout the blanket with its advanced technology wiring system that automatically changes temperature levels. It comes equipped with 10 multiple heat settings and a pre-heat function that gives you freedom to control the warmth level of your blanket as you require. The blanket uses intelligent technology of an auto-power off system that will give you peace of mind. You may leave your house knowing you are safe because of this function that shuts the blanket off after 10 hours of use. The Luxury Low-Voltage, Micro-Fleece Electric Heated Queen Size Blanket from SoftHeat, Natural has been designed as an extremely soft and safe electric blanket and it is probably the softest blanket on the market of its kind. The blanket has been made out of super-soft micro-plush fabric which feels extremely smooth and fresh for the human skin to touch and provides the user of this blanket the ultimate in luxury that can be offered. At the heart of this superb blanket lies the patented SoftHeat Safe and Warm Low-voltage technology which includes a box acting as a power supply which transforms the AC main 120 V voltage to low-voltage DC current which is non-hazardous. It is the equivalent of running the blanket on a battery. The product is made out of 100% polyester and parts of are is both manufactured in the United States as well as imported. The product is of very high quality and is based on patented technology. The manufacturer offers a limited warranty against defects due to materials and workmanship for 5 years. This is proof enough of the durability of the product and the manufacturer’s confidence in this product and the underlying technology. The quality of the product, as well as its performance, are maintained over many years. The Luxury Low-Voltage, Micro-Fleece Electric Heated Queen Size Blanket from SoftHeat, Natural does not involve messing with uncomfortable and bulky cables or wires which could get entangled with one another. The use of the ultra-thin wires inside the SoftHeat blankets is set in the blanket in such a way that the user would not even feel them. There are no spots on the blanket that get over-heated or stay colder than other areas. The heat is uniformly distributed throughout the blanket. The patented technology from SoftHeat is a low-voltage technology and keeps the user safe while he/she stays warm at the same time. The products from the manufacturers operate at voltages which are always lower than 25 volts. The current involved is just the one needed to operate a light bulb. The small power supply box is capable of converting the 120 VAC to low-voltage DC even if the blanket gets wet for some reason and it provides a safe way to heat up the user and keep him/her warm throughout the night. Extremely safe to use as 120 VAC mains voltage is converted to low-voltage DC. The electric blanket contains ultra-thin heating wires which are not even felt by the user. 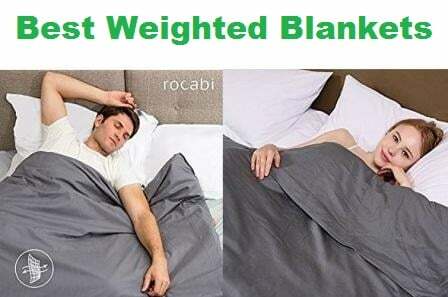 It distributes heat evenly throughout the blanket. This electric blanket is not available in Twin XL or California King sizes. 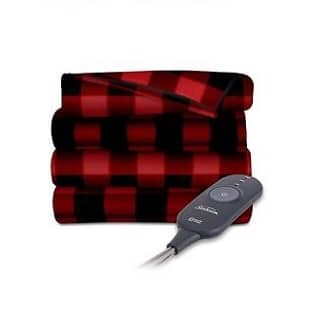 The Heated Fleece Travel Electric Blanket from Trillium Worldwide, 12 Volt, Red Plaid is can be very easily connected to any 12 V power outlet and the blanket would be able to get warm within a few minutes. This electric blanket is ideal for those who travel a lot and need to tuck into something warm in the night for a good night’s sleep. In fact, it can be used while traveling in many different types of weather conditions. The size of the blanket is 58 x 42 inches and this is enough to accommodate two people. For a single person, it provides ample space to be as comfortable as possible. The electric blanket is equipped with a timer which can heat it up for either 30 minutes or 45 minutes and then automatically shut-off. There is a reset button on the blanket as well. The temperature control is automatic and the blanket comes with a 7 feet long cord. 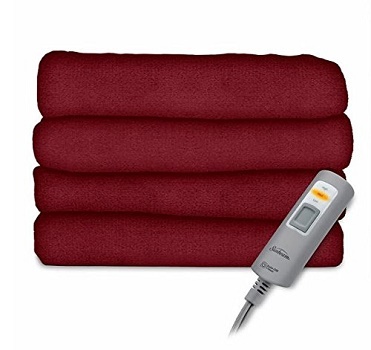 The Heated Fleece Travel Electric Blanket from Trillium Worldwide, 12 Volt, Red Plaid has the capability to keep passengers comfortable on long trips on the road and can be used for camping and other purposes as well. Wherever, there is no room heating and a warm bed is required, the electric blanket would serve the purpose ideally. It has been constructed using the hugest quality materials like 100% super-soft polyester fiber. the manufacturer has been known to the world as a supplier of consumer products which have often unique and innovative characteristics. 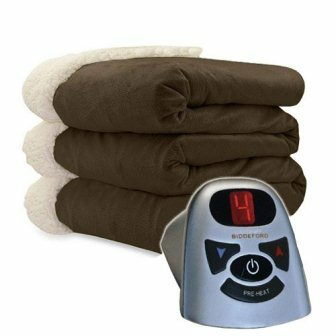 These products like this electric blanket provide quality products with ease of use as well as durability. 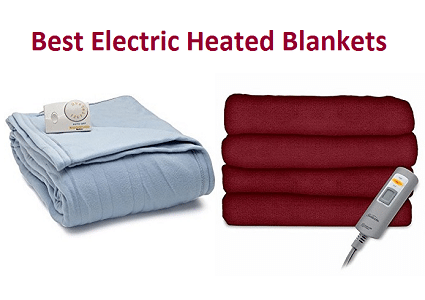 The Heated Fleece Travel Electric Blanket from Trillium Worldwide, 12 Volt, Red Plaid can be connected to any power outlet which gives 12 V DC. It does not take long for the blanket to be warmed up. It would take just a few minutes for the user to start to feel the warmth of the blanket. The Heated Fleece Travel Electric Blanket from Trillium Worldwide, 12 Volt, Red Plaid is extremely safe to use. it has got an automatic shut-off feature which gets activated when the timer is used by the user to heat up the blanket for either 30 minutes or 45 minutes. It provides warmth to the user even when it is not plugged to the power supply. The use of this electric blanket for kids on a long trip as they sit and rest in the back of the car is the most convenient and also extremely safe for the sleeping or resting children. The blanket connects directly to any 12 V outlet. The blanket heats up in a few minutes. It has a timer with 30 and 45 minutes heating with automatic shut-off feature. It does not have a pre-heat feature. The Luxurious Low-Voltage Electric Heated Micro-Plush Triple-Rib Blanket from Serta, Ivory, Twin has the capability to provide warmth to the user regardless of whether it is connected to a power source or not. The heat provided by the blanket while being plugged is evenly distributed throughout the blanket and thus, there are no hot spots or cold spots on the blanket which would otherwise disturb the user a lot during the night. The computerized controller provided along with the blanket is extremely easy to turn and read. It is also non-slip and helps to adjust the temperature of the blanket as per the user’s desire. In the night, thesis no need to turn on the light. The backlit display with auto dimming comes in handy at night and the user is able to make the adjustments quite easily. The Luxurious Low-Voltage Electric Heated Micro-Plush Triple-Rib Blanket from Serta, Ivory, Twin has been designed by the manufacturer provide the maximum level of comfort along with safety to the user. The electric blanket has got a decorative triple-ribbed design with super-soft micro-plush fabric. This makes the electric blanket extremely smooth and pleasant to touch and feel and proves to be just the ultimate in luxury and comfort. 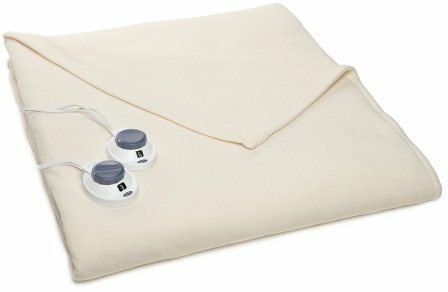 In order to provide warmth to the user without creating a lot of hassles and making things difficult for the user with bulky and messy wires and cables, this Luxurious Low-Voltage Electric Heated Micro-Plush Triple-Rib Blanket from Serta, Ivory, Twin does not involve handling bulky or entangling cables and wires. Many warm electric blankets in the market have very thick and bulky wires, however, in this blanket, these are very small and thin at the same time. This way, these wires are not even noticeable to many users. This very feature enables easy and safe operation and provides very even heat while completely eliminating the possibility of producing cold spots or hot spots which can otherwise irritate the user. The low-voltage technology employed in the construction of this electric blanket makes it extremely safe to use anywhere. 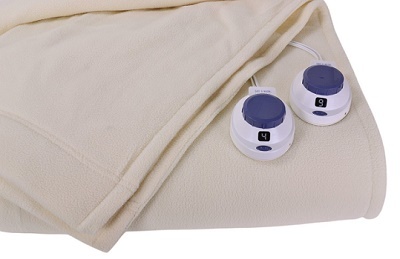 The safety and the warmth of the blanket go together and serve as blended characteristics for this electric blanket. The power supply boxes small and it is able to transform the 120 VAC input into 12 V DC output which is used to very safely warm up the blanket. It provides safety and protection as the level of voltage is non-hazardous. Thus, the electric blanket serves as a perfectly safe companion for the user at home or at other locations. The electric blanket is both safe and comfortable. It is powered by 120 VAC and thus can be easily used at homes or at a friend’s or relative’s place. It is easy to use and there are no entangling or bulky wires. The 6001-9362160-711 Micro Mink and Sherpa Heated Blanket from Biddeford Full Chocolate Brown have been designed by the manufacturer to exude luxury, softness, and comfort at their peak. This is a 100% polyester blanket which comes along with an extremely easy to read and use a digital controller. This controller has 10 settings for setting and controlling the heat. The blanket has been constructed using extremely thin wires which are not even felt by the user while making use of the blanket. This also adds to the comfort level of the user as he/she is not encumbered by the technology in the blanket in any way. The 6001-9362160-711 Micro Mink and Sherpa Heated Blanket from Biddeford Full Chocolate Brown are extremely durable as a result of the use of high-quality materials ion its construction as well as the use of trusted and tested technology to heat and control the level of heat in the blanket. The manufacturer’s confidence in the quality and durability of this mattress is manifested in the 5-year limited warranty offered by the manufacturer against defects due to workmanship and materials. 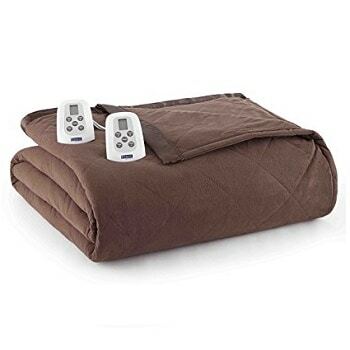 The 6001-9362160-711 Micro Mink and Sherpa Heated Blanket from Biddeford Full Chocolate Brown can be very easily used by the user by connecting it to an AC outlet anywhere at home or at any other location where the blanket is being used. The blanket does not involve any bulky cords or wires that can get entangled and cause discomfort or even end up posing a hazard. The wires inside the blanket are so thin that they do not even make themselves felt to the user. The power cord can be easily connected and the warmth of the blanket enjoyed. The 6001-9362160-711 Micro Mink and Sherpa Heated Blanket from Biddeford Full Chocolate Brown are extremely safe to use both at home or at any other location. The blanket has got the required safety features as well. In case, the user forgets or dozes off, the auto shut off feature of the blanket would turn off the heating after 10 hours. This also helps to conserve energy besides being a safety characteristic. The electric blanket is very safe to use and has an auto shut off feature. The blanket has 10 settings for heat control. It has no bulky cords or wires and is very convenient to use. The electric blanket cannot be used at places where there are no AC mains. The 12V Electric Heated Travel Blanket for Car, Truck, Boats or RV from Sojoy with Multi-Function Smart Timing and Low/Mid/High Temp Control, 54 x37 inches, Black has been designed to be the ideal blanket to be used while traveling. The travel could be by road or by boat. 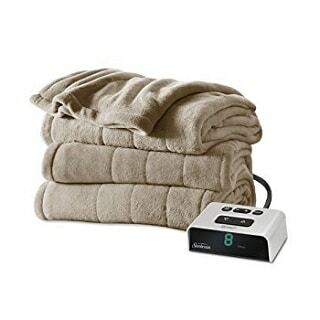 This electric blanket comes in handy as it does not require any AC source but can be connected directly to any 12 V power outlet. It is ideally suited for use in Cars, Trucks, SUVs, etc. as well as during camping or holidaying out at any location that does not necessarily have any AC power source nearby. Thus, it serves as the perfect travel companion regardless of the mode of transport as long as it is equipped with a 12 V power outlet. The 12V Electric Heated Travel Blanket for Car, Truck, Boats or RV from Sojoy with Multi-Function Smart Timing and Low/Mid/High Temp Control, 54 x37 inches, Black boasts trusted technology from Sojoy which includes a thermostat that has 3 different levels for controlling the heat provided by the blanket to the user. These help the user to adjust the blanket’s warmth to the level desired by the user at any time during his/her sleep or rest. It is extremely quick to heat up and thus serves as the ideal choice for winter nights when the user would want to warm up as quickly as possible. The 100% soft, high-quality polyester fleece contained in the blanket makes it highly durable as well as imparts the highest quality standards to the blanket. The 12V Electric Heated Travel Blanket for Car, Truck, Boats or RV from Sojoy with Multi-Function Smart Timing and Low/Mid/High Temp Control, 54 x37 inches, Black simply plugs into the car’s cigarette lighter socket just like the cell-phone charger designed for automobiles. IT can be used in any transport that has a 12 V power outlet of this type. This electric blanket provides quick and easy warmth at night in emergencies. The power cord provided with the electric blanket is 63 inches long and it has got an LED indicator light which enables the user to know that it is conducting current to the electric blanket. The placement of the ultra-thin wires within the blanket as well as the very fact that the electric blanket operates at 12 V make this electric blanket extremely easy to use. There is no high voltage to low voltage conversion either. The blanket is fed by the 12 V power source and thus is extremely safe to use as this level of voltage is non-hazardous. It can be connected to the 12 V cigarette lighter socket on any transport vehicle. It is extremely safe as a result of the low voltage. The blanket uses 100% soft, high-quality polyester fleece which makes it very comfortable. It has only 3 levels of heat control.